Video Project vs. Video PartnershipTraditional video production is no longer effective for your business, which is why we evolved beyond that. 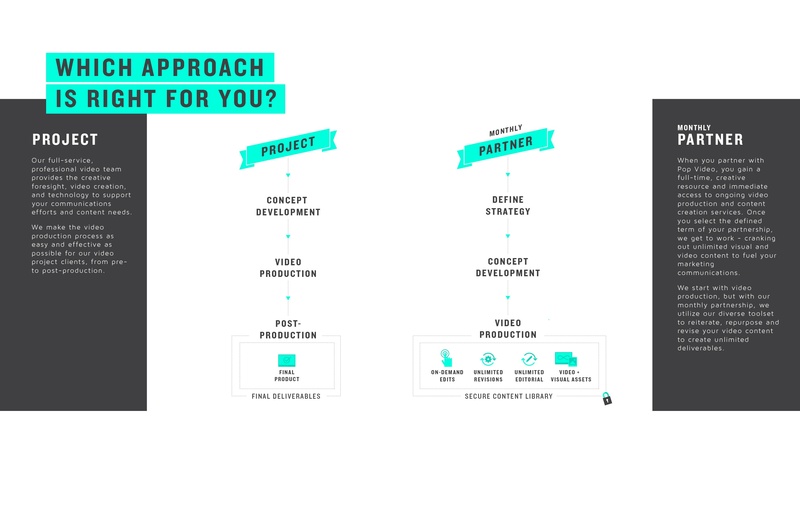 We offer two approaches to video content creation - video projects and video partnerships. A few questions to answer before selecting the best video approach for your business, include: how many videos do you need? How often do you need video and visual content? Is your content need singular or ongoing? Do you just want video, or would your campaign benefit from iterated visual content? Our full-service, professional video team provides the creative foresight, video creation, and technology to support your communications efforts and content needs. We make the video production process as easy and effective as possible for our video project clients, from pre- to post-production. When you partner with Pop Video, you gain a full-time, creative resource and immediate access to ongoing video production and content creation services. Once you select the defined term of your partnership, we get to work - cranking out unlimited visual and video content to fuel your marketing communications. We start with video production, but with our monthly partnership, we utilize our diverse toolset to reiterate, repurpose and revise your video content to create unlimited deliverables. We can connect on both a project and partnership level for video, but it truly depends on your content needs and marketing goals as a business. Visit our Why Pop page for a further explanation on our process, and why you should choose Pop Video for your video and visual content partner.